WordPress admin dashboard is the place where you can manage all your activities starting from creating a simple post to managing multi-site network. Over the period of time the administrator interface of the self-hosted WordPress site has been improved a lot. 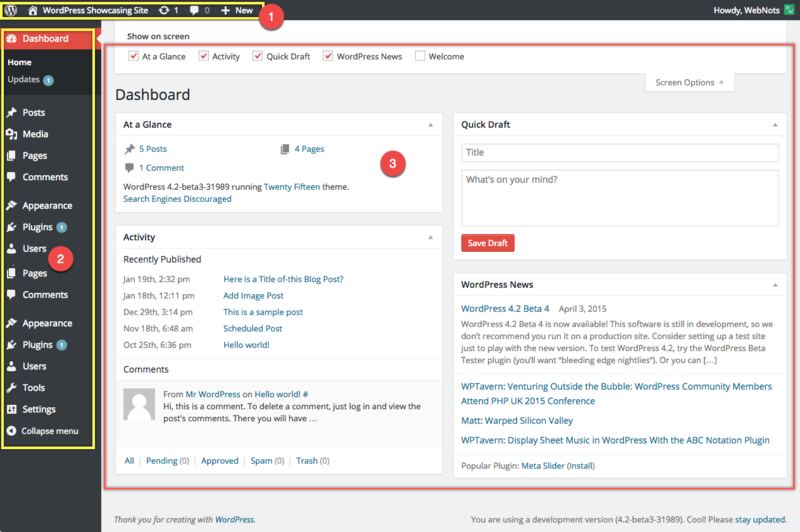 When we write this article with the beta version of WordPress 4.2 there are quite a lot things you can do it in the front end with lot more ideas for improvements still can make users life easy. Learn more on 5 Admin panel settings every WordPress beginners should know. Admin interface consisting of below panels. Top admin bar showing options to view the site and few icons as a quick launch. Menu items with the mouse over fly out sub-menus. Display area shows the dashboard content based on the chosen menu. WordPress admin interface contains a simple top bar called admin bar having a few useful icons. · Feedback Check details of the installed WordPress version. Resource Links to WordPress.org site. Home Visit home page of you site. Updates View available updates for WordPress version, themes and plugins. Comments Shows comments waiting for moderation. · User Add new post, media file, page or user. Username · User Profile View user profile and log out from the admin interface. There are certain menus appear by default with your WordPress installation and there will be new menus added based on your theme’s and plugin’s settings. Below are the details of menus available in the WordPress admin interface and what can you do with it. · Updates Dashboard view showing quick links and available updates. · Tags Create posts, categories and tags. · Add New Upload and manage files like images, videos, audios, PDF, etc. · Add New Create pages. Comments Manage comments like approve, reject or delete. · Editor Customizing themes, widgets, menus, etc. Editor allows you to edit core theme files. · Editor Install and customize plugins. Editor allows you to edit plugin core files. · Your Profile User management for multiple users. · Export Site import and export options for site migration. · Permalinks Overall site settings to control the behavior. Collapse Menu Expand or collapse the menus to make the display area wider. Above mentioned menus are only the default menus and additional menus will get added when you install new themes and plugins. Sometimes you will be lost with the vast options, especially if you are new to WordPress and need to spend lot of time in correcting the simple display. Check out some tips to customize WordPress admin interface. Clicking on the menu will take you to the first option in the fly out sub-menu by default. WordPress admin front end is responsive and get auto adjusted based on the browser window size. WordPress also offers iOS and Android apps to administer your site on the go from mobile devices. Learn more on WordPress admin panel settings menu options.